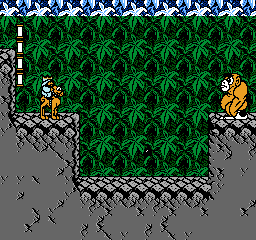 There's no better way to celebrate Christmas than to play the notoriously bad unlicensed NES game by Wisdom Tree, King of Kings. It's got three games in one and they're all piles of reindeer poop. 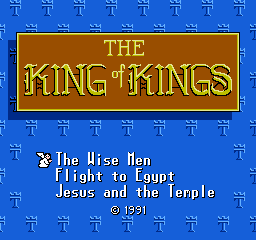 All I cared about for now though was the first game, "The Wise Men". 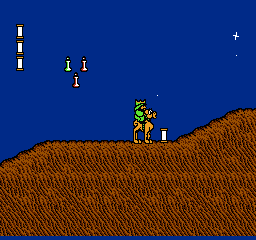 In it, you play as a wise man riding on a rock-spitting camel who is following the star to find baby Jesus. From there, it's just simple platforming with horribly slippery physics. I traversed the desert and collected scrolls for health, along with frankincense, myrrh, and gold for completely useless bonus points. 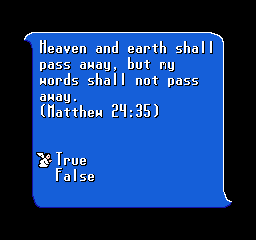 Scrolls could only be collected by answering Bible trivia questions which were often reused. Even though the health apparently maxed out at five, you could continue collecting more than that and it would just not be shown on-screen. The fifteen stages varied wildly between stupidly hard, stupidly easy, and just plain stupid. 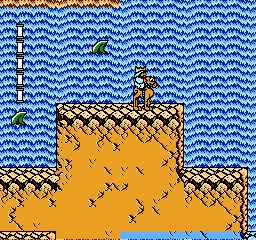 Much of the platforming was unexpectedly hard, and falling would often make you to start all over. One level required you to re-enter a door that you just came out of in order to get to a new area. It was dumb. There were also sharks in the waterfalls. Better than a sharknado I guess. At last, I reached baby Jesus. 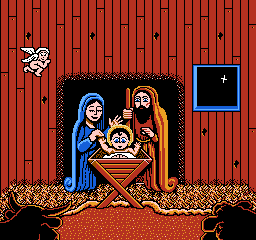 Along with this screen, my reward was an 8-bit rendition of Away in a Manger, which I guess was better than the 8-bit version of We Three Kings that played for the entire rest of the game. There weren't any credits, but there was this final screen instead. Regrettably, I don't have the beginning or the end of the manual, so you'll have to keep wondering about that. Now that baby Jesus has been found, you may resume having your merry Christmas and happy new year. 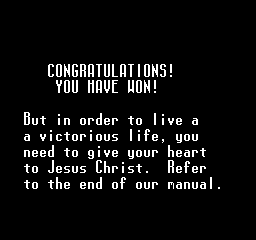 Also check out my pitches for 7 Bible-based games that'd be totally righteous.